12:06 Megaf what am I looking at? 12:11 Megaf is layouting even a word? 12:16 rubenwardy how themable is Qt? Can it be made to look like a game? 12:17 CalebDavis idk but tre wasnt it under a propriatary license? 12:20 CalebDavis would we keep backsupport for formspecs for mods? 12:22 sfan5 do you know what bitmap fonts means? 12:26 sfan5 what about scaling? 12:27 Megaf why we just dont clean the code and make it better before begin to change everything again? 12:27 Megaf why dont we stop adding things and begin fixing the things we have already? 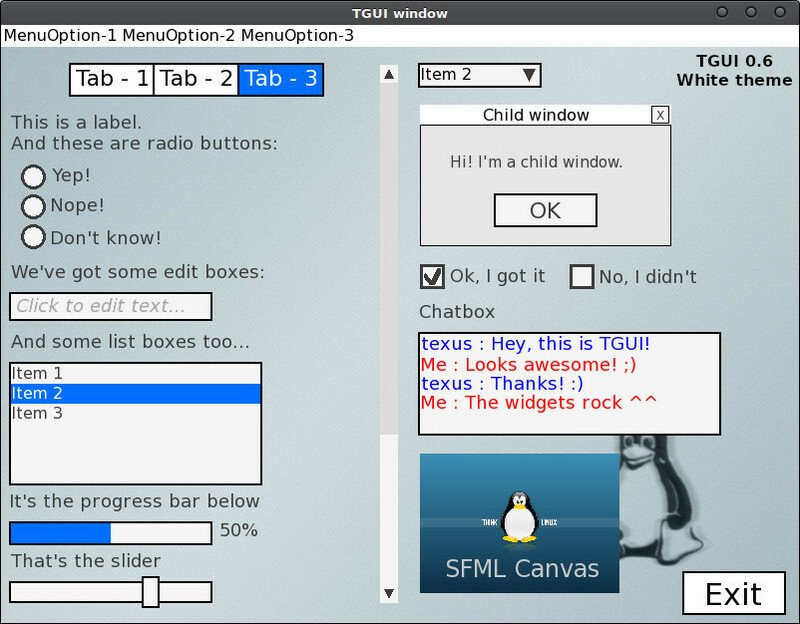 12:30 nerzhul rubenwardy, how do you include a TGUI windows in irrlicht windows ? 12:31 nerzhul can you provide that ? 12:31 nerzhul rubenwardy, also, does the MT teams wants that for 0.5 ? 12:32 twoelk does TGUI work well on android? 12:35 ThomasMonroe would that be efficient though? 12:40 nerzhul rubenwardy, you mean on android ? 13:03 ThomasMonroe twoelk, under feature discussion? 13:23 sfan5 rubenwardy: could you take a look at the comment i posted on the issue and tell me if i'm missing anything major? 13:24 sfan5 "all of that sounds good to me." 13:36 ThomasMonroe what do you mean toolkit-independent? 19:23 paramat nerzhul are you able to +1 #6483 now? or anyone else? 20:09 celeron55 lhofhansl: do you think there's something i need to do other than that? 20:10 Krock passing the contribution rules and such as reminder? 20:11 paramat is there still a way of merging on github that should be avoided: the one that creates an extra commit entry in hisotry? 20:14 lhofhansl celeron55: I don't know :) I think there're some links to some guidelines or something. 20:15 Krock wasn't there one last week? 20:16 ThomasMonroe celeron55, did you happen to see the convo earlier about the lua formspecs? 20:17 lhofhansl 6pm GMT is 11am PST, I'm usually out at that time. 20:18 lhofhansl Hanging out on the forum is easy enough. Joining IRC more often is also easy. 20:18 celeron55 ThomasMonroe: missed it, but can look it up; what about it? 20:21 lhofhansl Got the invite. Thanks! 20:21 red-001 what do you mean in an if statement? 20:22 lhofhansl Are there core-dev guidelines to read? When to use which labels? How many approvals needed? Anything else...? 20:23 Flairieve Oh wait this isn't modding discussion? 20:27 red-001 shouldn't a branch be created for 0.4.17? 20:27 lhofhansl I too prefer the command line. No black github magic in the way. 20:32 celeron55 ThomasMonroe: if you made a forum topic, can you link it? 20:33 red-001 so how do you fix it? 20:53 red-001 anyone want to comment on the idea behind #6528? The implemenation as you can see isn't finished yet. 21:03 lhofhansl which of the MT forums should I hang out in? Is there one for devs? 21:04 red-001 there is more then one forum? 21:06 lhofhansl Ok... I thought there might have been one specifically for devs. All good then. 21:16 lhofhansl comments on #6529? 21:16 ShadowBot https://github.com/minetest/minetest/issues/6529 -- Discuss: Make zoom a real zoom? 21:18 lhofhansl nope. not at all. 21:49 paramat could someone do what is needed to group lhofhansl together with the other code devs in an IRC client userlist? 22:34 red-001 paramat, is there a list of mt-game core devs anywhere? 23:05 lhofhansl paramat: Lemme know when you got a chance to test #6483 again. Can be my first push. 23:16 paramat ah so you're registered with nickserv now? 23:26 lhofhansl "cloak ask"? I'm a very occasional IRC user. 23:28 red-001 just replaces your ip/hostname with "unaffiliated/lhofhansl"
23:31 lhofhansl ah. that's nice. Then again, my name gives me away anyway.